brains, not for just any ordinary hunter. and the weapon was quietly ushered into permanent storage. The Church Cannon is quite similar to the Cannon, but with some key differences. Shots do not travel straight ahead a set distance before exploding. Instead, they launch in a curved trajectory and explode upon impact. 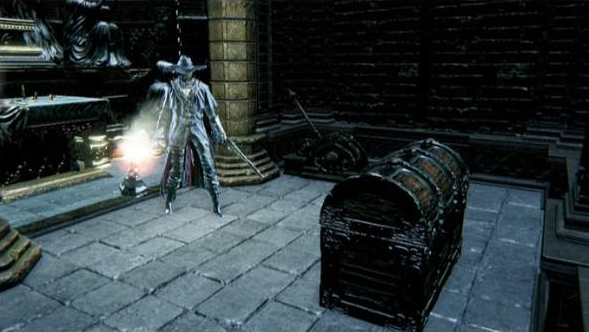 You'll use 10 Quicksilver bullets for each shot, which is less than the Cannon, but you'll also deal less damage. This is still really good, since you'll be able to fire twice without equipping the Formless Oedon Rune. Though with this rune in combination with blood bullets, you can even shoot three times! You can actually send shots much further than the Cannon's by aiming your camera upwards while firing. This isn't very practical to do in the middle of combat, however. Shots can fly over the heads of enemies and past them, and you won't be able to see if they've moved out of position. These things aside, it can still work as a handy preemptive attack from outside of an enemy's field of vision. Treasure in (Main Game): Hunter's Nightmare, from Underground Corpse Pile. This is under the altar/elevator that takes you to the Research Halls. You need to jump off the altar and a second platform will show (where Laurence's Skull is). Once the second platform is there, use the device to bring the elevator down and stand on the second platform that will take you lower than the ground. Inside here is a chest with the Church Cannon. You can use Monocular to manually aim the Church Cannon, especially useful for longer distances outside of lock on range. 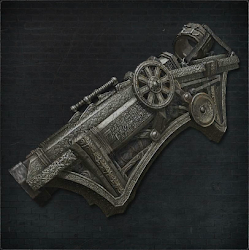 Even though it deals lower amount of damage than Cannon it is considered better choice in all aspects other than for staggering large enemies. Church Cannon has faster reload time, projectile explodes upon impact not in mid air and it costs two less bullets to shoot.